Welcome to our first Free-From Bulletin specifically for suppliers of free from products and services. Did you catch the article in the The Telegraph #100top chefs attack EU Allergen law. Can this type of article damage the free-from community or does it just highlight the need for more restaurants to supply the free-from community? Check out the debate on Twitter #14 allergens. As suppliers you will need to help caterers provide the correct ingredient information, get ahead of your competitors and promote how well you are doing this by listing on our free-from marketplace. The marketplace on our website is now established for like minded suppliers to promote their products and services for FREE. Food businesses are searching for alternative free-from products – Sign up today and don’t miss out. If you have a innovative product or service and would like to showcase this in the newsletter to our food service distribution list then please email me a description with accompanying images and we will choose the best one. We are attending and working with a number of events this year who want to highlight the free from sector, take a look at our events calendar on the left for more information. We will be featuring an event in each newsletter to give you information on opportunities for your business. The new food allergen laws will be the hot topic this year for the 6,000+ attending. The organisers have found a huge surge in interest in allergy awareness, allergy free menu ideas and suppliers of allergy free food (76% of the audience want to know more about allergy free menu ideas compared with 28% at the last show). The zone we are hosting is going to be filled with allergy free suppliers it will be a great marketing opportunity to meet a huge amount of potential new clients. The types of visitors will be takeaway, restaurant, coffee shop and fish and chip shop owners. There are already a lot of VIP visitors attending from the likes of Nandos, Five Guys Burgers, McDonalds, GBK, Wagamama and Pret A Manger. Have a look at the websites for Takeaway Expo and Street Food Live. Promote your business for FREE to the food service and retail businesses. Our aim is to introduce a choice of free from options into the food service industry. When we are training or speaking at events we go out of our way to promote businesses who offer good quality free from products or solutions which will enhance their business offering to the wider audience. We direct them to our free from market place, sign up here today and we will share your details. Opens Monday 8th June 2015 and are looking for sponsors for these growing prestige awards – find out more here. 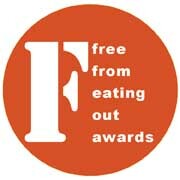 The FreeFrom Eating Out Awards have been launched to raise awareness of the huge opportunities offered by ‘freefrom’ food within the food service sector, especially now that the new allergen regulations affecting food service have come into force. Should caterers provide written allergy information?